Senior health, trade and small business officials from the 21 APEC members are seeking to amplify the role of small and medium enterprises in mitigating unfolding health concerns that threaten three billion lives and the stability of economies across the Asia-Pacific. Actions to make it easier for small firms in APEC economies to participate in the cross-border production and trade of healthcare products such as cutting-edge medicines and medical devices, and reduce their costs and safety risks for consumers, were taken forward by officials during just concluded meetings in Atlanta. The region’s rapidly aging populations and increasing expenditure on healthcare and public pension systems add to the need for urgent policy remedies. Officials are coordinating with industry representatives to identify and lower trade barriers that raise costs for consumers and make it costly or prohibitive for businesses, particularly small and medium enterprises, to integrate into the different stages of international production and trade of goods—known as global value chains. Harmonizing APEC members’ regulatory regimes is a priority, including work to establish well-defined and consistent medical product approval procedures among them within five years. Officials are formulating new measures to crack down on illegal internet pharmacies and the trade of counterfeit medical products, protecting consumers and legitimate businesses within the sector. A pilot project is also being launched to facilitate the adoption of global data standards by companies in APEC economies, reducing costs for governments and exporters, including small firms, while increasing the integrity of industry supply chains in the region. Work is further underway to promote adoption of the APEC Principles for Business Ethics in the Medical Device and Bio-Pharmaceutical Sectors among small and medium enterprises. The aim is to reduce incidents of corruption that raise business costs in the industry, driving up prices for consumers, as well as to ensure that healthcare decisions are made in a patient’s best interest. Small and Medium Enterprise Ministers from APEC member economies will meet on 25 September in Iloilo, the Philippines to review the progress of these initiatives and take further policy actions to promote new trade opportunities for small businesses in the region. Parallel measures to lower Asia-Pacific trade barriers for small businesses that were advanced by APEC member officials in Atlanta are described here. 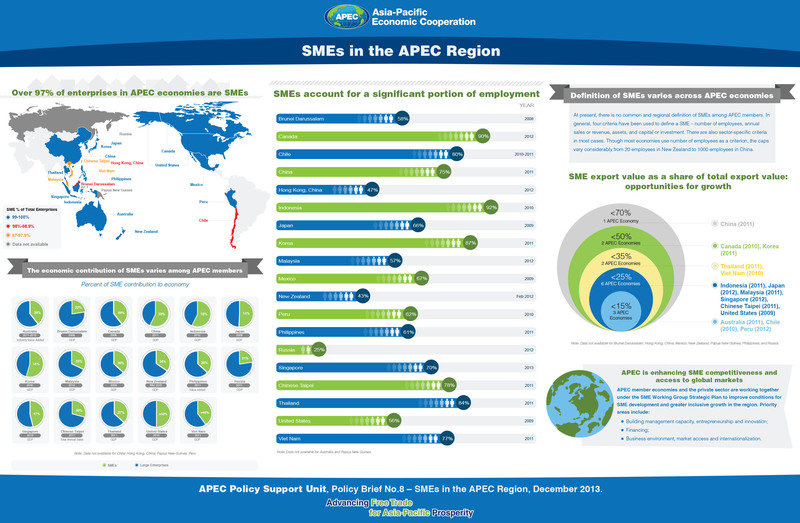 Additional information on APEC member initiatives to boost small businesses and their participation in trade can be found at this link.